Error bars indicate standard error. eFigure. Sample Discrete Choice Question. eTable. Characteristics of Parent Respondents (n=820) and Non-Respondents (n=1412). American Academy of Family Physicians, American Academy of Pediatrics, American College of Physicians and AOA. Joint Principles of the Patient-Centered Medical Home. http://www.aafp.org/dam/AAFP/documents/practice_management/pcmh/initiatives/PCMHJoint.pdf. Published 2007. Accessed November 18, 2014. Blue Cross Blue Shield of Michigan. Physician Group Incentive Program: Patient-Centered Medical Home Initiatives. Detroit, MI: Blue Cross Blue Shield of Michigan; 2010. National Committee for Quality Assurance. Standards and Guidelines for NCQA’s Patient-Centered Medical Home (PCMH). Washington, DC: National Committee for Quality Assurance; 2011. Safety Net Medical Home Initiative. Neal R, Moore L, Powell J. Enhanced Access: Providing the Care Patients Need, When They Need It. http://www.safetynetmedicalhome.org/sites/default/files/Implementation-Guide-Enhanced-Access.pdf. Published 2013. Accessed November 18, 2014. Burge P, Devlin N, Appleby J, Rohr C, Grant J. London Patient Choice Project Evaluation: A Model of Patients’ Choices of Hospital From Stated and Revealed Preference Choice Data. Cambridge, England: RAND Corporation; 2005. Ryan M, Gerard K, Amaya-Amaya M, eds. Using Discrete Choice Experiments to Value Health and Health Care. Dordrecht, the Netherlands: Springer; 2008. Knowledge Networks. Knowledge panel design summary. http://www.knowledgenetworks.com/knpanel/KNPanel-Design-Summary.html. Published 2010. Accessed April 6, 2012. National Center for Health Statistics. National Survey of Children’s Health. http://www.cdc.gov/nchs/slaits/nsch.htm. Accessed June 3, 2014. Importance Efforts to transform primary care through the medical home model may have limited effectiveness if they do not incorporate families’ preferences for different primary care services. Objective To assess parents' relative preferences for different categories of enhanced access services in primary care. Design, Setting, and Participants Internet-based survey that took place with a national online panel from December 8, 2011, to December 22, 2011. Participants included 820 parents of children aged 0 to 17 years. Hispanic and black non-Hispanic parents were each oversampled to 20% of the sample. The survey included a discrete choice experiment with questions that asked parents to choose between hypothetical primary care practices with different levels of enhanced access and other primary care services. Main Outcomes and Measures We estimated parents’ relative preferences for different enhanced access services using travel time to the practice as a trade-off and parents’ marginal willingness to travel in minutes for practices with different levels of services. Results The response rate of parents who participated in the study was 41.2%. Parents were most likely to choose primary care offices that guaranteed same-day sick visits (coefficient, 0.57 [SE, 0.05]; P < .001) followed by those with higher professional continuity (coefficient, 0.36 [SE, 0.03]; P < .001). Parents were also significantly more likely to choose practices with 24-hour telephone advice plus nonurgent email advice (0.08 [0.04]; P < .05), evening hours 4 or more times a week (0.14 [0.04]; P < .001), and at least some hours on weekends. Parents were significantly less likely to choose practices that were closed during some weekday daytime hours or had wait times longer than 4 weeks for preventive care visits. There was very little variation in preferences among parents with different sociodemographic characteristics. Parents' marginal willingness to travel was 14 minutes (95% CI, 11-16 minutes) for guaranteed same-day sick visits and 44 minutes (95% CI, 37-51 minutes) for an office with idealized levels of all services. Conclusions and Relevance As primary care practices for children implement aspects of the medical home model, those that emphasize same-day sick care and professional continuity are more likely to meet parents’ preferences for enhanced access. Practices should seek to engage families in prioritizing changes in practice services as part of medical home implementation. Enhanced access is a key component of recent efforts to improve primary care for children in the United States, particularly through implementation of the medical home model.1,2 Within the context of medical home implementation, enhanced access services typically include multiple options for communication during and after office hours, same-day sick visits, and extended weekday or weekend office hours.2-4 Enhanced access services are intended to improve the quality and family centeredness of care by providing families with additional options for communicating with primary care professionals, such as through 24-hour telephone services and email, and for getting direct care when needed. Of the many components of the medical home, changes in enhanced access will likely be among the most apparent and tangible to families. However, implementation of enhanced access services is resource intensive for primary care practices and, as a result, practices typically must prioritize which services they will implement and consider potential trade-offs with services the practice currently provides.5-8 For example, holding a larger percentage of appointments for same-day sick visits might result in fewer appointments for preventive care visits and longer times to the next available appointment for a preventive care visit. There is a small but growing body of evidence that patients’ preferences for the characteristics of health care services can significantly influence the use of current services and uptake of new services.9-12 If patient and family preferences are not considered when setting priorities for changes to existing services or implementing new services in the medical home, there is a significant risk that families may be dissatisfied with changes, new services will be underused, or the investment of resources will be inefficient or ineffective in improving care. We conducted an Internet-based survey of a national sample of 820 parents in the United States from December 8, 2011, to December 22, 2011. Participants were sampled from a nationally representative online panel of individuals maintained by Knowledge Networks, a survey research firm.14 This standing online panel is maintained through address-based sampling similar to the US Census. As part of the panel, households are provided free computer hardware and Internet access if they do not have these at the time of recruitment. For this survey, we sampled parents (≥18 years) from the standing online panel with children between the ages of 0 and 17 years in the household. We oversampled Hispanic and black non-Hispanic parents to approximately 20% of the sample each to provide statistical power for cross-group comparisons. Parents reported demographic information for all children in the household. One child was then randomly selected and the parent was instructed to think of that child when answering questions. This study was classified as exempt from human participants review by the University of Michigan Institutional Review Board and the need for informed consent was waived owing to the collection of deidentified data with minimal risk to the participants. The online survey included a discrete choice experiment (DCE) designed to elicit parents’ preferences for enhanced access services in their child’s primary care office (sample question in the eFigure in the Supplement; full survey instrument in the eAppendix in the Supplement). Discrete choice experiments are part of a group of preference-based survey methods grounded in economic theory referred to as conjoint analysis.11,15 Discrete choice experiments are increasingly used to measure patients’ preferences for characteristics of a variety of health care services.9,10,16-20 In DCEs, respondents complete a series of questions each with a hypothetical scenario in which respondents are asked to make a choice between 2 or more options with defined characteristics (referred to as attributes) that are assigned different values (referred to as levels) for each of the options within the scenario. The choices that respondents make across multiple scenarios can be used to infer respondents’ relative preferences for the levels of each attribute and their willingness to make trade-offs between attributes. Following methodological guidelines for DCEs,21 we identified important attributes of enhanced access services through a literature review of medical home programs,2-4 discussions with pediatricians and primary care administrators, and qualitative interviews with parents.13 The key attributes of enhanced access and potential trade-offs in this survey were communication outside of office visits, same-day sick visits, late office hours, weekend hours, wait times to next available preventive care visit, weekday hours, and professional continuity (Table 1). Discrete choice experiments also typically include an additional value attribute, such as cost or travel time, to allow for comparisons of preferences on a standardized scale.11 We chose travel time as a value attribute because in pilot testing it was meaningful and intuitively understandable for parents. Each of these attributes was then assigned 2 or 4 levels with the values of these levels based on the literature review, discussions with pediatricians and practice administrators, and qualitative interviews with parents. In addition to the discrete choice questions, the survey included questions about child sociododemographic characteristics including child age, special health care needs,22 insurance status and type, and parent-reported child health. As part of the standing panel, Knowledge Networks maintained information about respondent (parental) self-reports of race/ethnicity, education level, and household income. Because the sample was drawn from a standing panel, sociodemographic information was also available for nonrespondent adults. Survey instructions and questions were written at the ninth grade reading level (based on the Flesch-Kincaid grade level). The survey was pilot tested with a sociodemographically diverse group of 20 parents as part of a qualitative study13 and revisions were made based on responses during interviews to improve readability and comprehension. The survey was then pretested with an independent sample of parents from the Knowledge Networks panel (n = 122) to estimate response times and nonresponse rates for specific questions. We estimated preferences for the different levels of attributes using a mixed logit model. The coefficients from the mixed logit model represented estimates of the probability of choosing a primary care office as a function of the levels of the attributes for that office. The mixed logit accounted for repeated choices by the same respondent and allowed for random coefficients at the respondent level. Effects coding was used to allow estimation of preferences for all levels of each attribute including the reference level.23 We first estimated a main effects mixed logit model and then estimated models with interaction terms to assess potential differences in preferences across groups with different sociodemographic characteristics including child age, parent-reported child health, special health care needs, and health insurance; parent race/ethnicity; household income; and urban vs rural residence. We also tested stratified models by race/ethnicity to assess the size of any significant differences found from the interaction terms. Results from the main effects mixed logit model were used to calculate a marginal willingness to travel for each level of each attribute, representing how much farther respondents were willing to travel for an office with a given level of an attribute.11 All analyses were performed using Stata 12.1 (StataCorp LP). Statistical significance from 0 for coefficients and marginal willingness to travel of individual services was determined from the results of the mixed logit model at the P < .05 level. Statistical significance from 0 for marginal willingness to travel of primary care offices with hypothetical combinations of services was assessed using the linear combination of coefficients, also with a significance level of P < .05. Eight-hundred twenty parents participated and completed the survey, including the discrete choice experiment questions, with a response rate of 41.2%. The demographic characteristics of participating parents and their children are shown in Table 2. Based on comparisons with demographic characteristics of nonrespondents, there was less participation from parents who were female, younger, or black; had lower educational attainment; or lived in low-income households (eTable in the Supplement). In the discrete choice analysis, the coefficients for nearly all levels of the included attributes were significantly different from 0, suggesting the attributes were meaningful to parents in making choices between practices (Table 3). In analysis of discrete choice experiments, coefficients for levels of attributes that are significantly different from 0 indicate the level influenced the choices made by respondents; coefficients that are not significantly different from 0 suggest that the level was not meaningful to respondents. Other attributes showed large increases in preferences between the worst level and the first level of improvement with only incremental gains for each subsequent level. For example, parents strongly preferred practices with 24-hour telephone access compared with those without this service but there was little change in preference with the addition of access by email or a secure website. Similarly, offices with some evening and weekend hours were strongly preferred compared with offices with no evening or weekend hours, but beyond that, increases in the number of evenings or weekend hours made little change in preferences. When we tested interaction terms between sociodemographic characteristics and preferences for different levels of practice attributes, we found little significant variation (data available on request). Parents of younger children had stronger preferences for evening hours compared with parents of older children. Parents of children with special health care needs had stronger preferences for professional continuity. Parents of children with public insurance had stronger preferences for evening hours compared with parents of children with private insurance. Black non-Hispanic parents and Hispanic parents had stronger preferences for same-day sick visits and walk-in visits and had weaker preferences for being open 5 full weekdays compared with white non-Hispanic parents. Despite being statistically significant, the magnitude of differences in preferences across groups was small. Parents reported a mean travel time of 16 minutes (95% CI, 15-17 minutes) and median of 15 minutes (interquartile range, 10-20 minutes) to their child’s current primary care professional. Based on the discrete choice analysis, parents were willing to travel an additional 14 minutes (95% CI, 11-16 minutes) for a practice that always had same-day sick visits and an additional 9 minutes (95% CI, 7-10 minutes) for good professional continuity (Table 3). Parents’ willingness to travel to a practice with the highest levels of all attributes was 44 minutes compared with a standard pediatric office setting (95% CI, 37-51 minutes). In this study in a national sample of parents, we used a DCE to assess the enhanced access services that parents would be likely to prioritize in the resource-constrained environment of most primary care practices. We found that parents’ preferences were strongest for access to same-day sick visits followed closely by their strong preferences for good continuity with their child’s primary care professional. Parents reported a willingness to increase the travel time to their child’s primary office by significant durations to obtain these services. Parents had significant preferences for other enhanced access services, such as 24-hour telephone advice, access by electronic communication, and evening and weekend office hours but these preferences were not as strong as those for same-day sick care and professional continuity. The strength of these preferences was similar across parents with different sociodemographic characteristics. Implementation of the medical home model has been criticized for being driven by the preferences of practices and health systems and not being truly patient centered in responding to the needs and expectations of patients and their families.25,26 The results from this study could be used by practices at any stage of medical home implementation to consider which enhanced access services they should prioritize to best meet the preferences of families. Short of directly using the results from this study, our results illustrated the importance of considering parents’ preferences and the trade-offs parents might be willing to make for services in their child’s primary care office. Future research is needed to assess whether incorporating parents’ preferences into medical home implementation has the potential to improve primary care use and, ultimately, child health outcomes. Primary care practices for children that emphasize same-day sick care and professional continuity are more likely to meet parents’ preferences for enhanced access. Our study provided important information for practices that could inform which enhanced access services to implement to meet parent preferences. Practices should engage families in prioritizing services that may be added or changed as part of medical home implementation. Corresponding Author: Joseph S. Zickafoose, MD, MS, Mathematica Policy Research, 220 E Huron St, Ste 300, Ann Arbor, MI 48104 (jzickafoose@mathematica-mpr.com). Accepted for Publication: November 22, 2014. 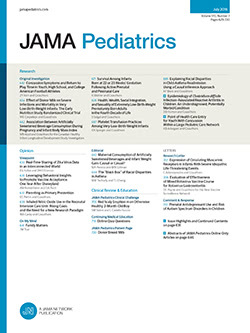 Published Online: February 2, 2015. doi:10.1001/jamapediatrics.2014.3534. Author Contributions: Dr Zickafoose had full access to all of the data in the study and takes responsibility for the integrity of the data and the accuracy of the data analysis. Drafting of the manuscript: Zickafoose. Funding/Support: This work was supported by a grant from the Blue Cross Blue Shield of Michigan Foundation. Development of the survey was supported by seed grant UL1RR024986 through the Michigan Institute for Clinical and Health Research at the University of Michigan. Dr Zickafoose was a research fellow in the CHEAR Unit, Division of General Pediatrics, University of Michigan at the time of the study and was supported by training grant T32 HD07534 from the National Institute of Child Health and Human Development. Additional Contributions: We thank Achamyeleh Gebramariam, MS, Child Health Evaluation and Research (CHEAR) Unit, Division of General Pediatrics, University of Michigan, for his assistance with the statistical analyses in this study. A portion of his time was subsidized by the grant from the Blue Cross Blue Shield of Michigan Foundation listed above.